Olympia automobile excursionists will leave from the Chamber of Commerce this morning at 9 o’clock for Yelm, where the Yelm Irrigation company will hold the formal opening of its $100,000 Thurston county project. R.D. White, of Yelm, has filed notice, as agent of the Yelm Irrigation Company, of intention to appropriate 2,000 cubic feet of water per second from the Nisqually River, for irrigation purposes on Yelm Prairie. With the appropriation of the water rights it is apparent that all details have been perfected and one of the grandest schemes for the improvement of farming lands will soon begin its sphere of usefulness. The effect of simply copious supplies of water on arid lands has been a gratifying surprise of the possibilities in store from this simple alternative. It has been found that it is a veritable Midas-touch to large areas that had up to a quite modern date been regarded as almost worthless. The notice also states that this water may also be used for generations of electric power. YELM, June 17.–Stretching southerly from Tacoma, through Pierce and Thurston counties, lie the Nisqually Plains, essentially a wide, gently rolling, open prairie country, but with enough timber in patches to give the landscape variety and charm. To the stranger traveling through, it is a surprise, so entirely different from anything else in the Puget Sound country. A surprise it must have been to the pioneers who came up through the jungles from the Columbia river or across rugged wilderness of the cascades–a pleasant and welcome surprise. probably, for they settled down at Steilacoom, Tumwater and other points on the plains. One of the earliest communities and groups of these people also being at what is now known as Nisqually, one of the earliest newspapers in the state being published at that point and being known as the Nisqually News. Grass was very abundant on the prairies in the early days, furnishing pastures for the herds of cattle, sheep and horses. Thomas Chambers, early pioneer of Yelm, told of herding sheep on the prairies as a boy and how he had to ride a large horse to keep track of his flock in the tall grass. Gradually the prairie became denuded of grass from over pasturing. The virgin prairie would produce indifferent crops of grain for a time but soon the porous, sandy soil became impoverished and incapable of producing grain and lack of moisture in the summer mouths prevented the production of crops of greater moisture requirements. 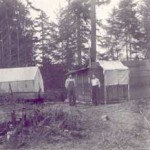 One of the earliest prairie settlements is the Yelm community, on Yelm prairie, Thurston county some 25 miles south of Tacoma and 19 miles southest from Olmypia where such pioneers as the Longmires, Chambers, and others settled on their donation claims in early days, and raised stock, grain, and other crops as long as the soil would produce. Some 20 years ago many sceond generation pioneers were still here and at that time the principal owners of the land were Thomas Chambers, L. N. Rice, James Mosman, O. K. and Chester Thompson, . . and the Solberg farms, the Mckenna Lumber Company and a few others. There were probably some 10 or 12 families occupying the principal part of the 6,000 acre prairie. About 24 years ago some of the farmers on the Yelm prairie conceived of the idea thatr irrigation water wouldf transform the prairie into fertile fields and keep grains, pastures, and other crops green and thriving throughout the dry summer months to a bountifyul harvest. 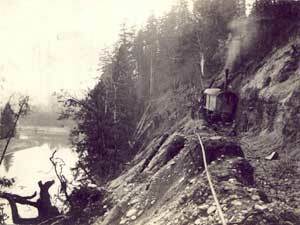 The idea that irrigation soon took shape and a few of the land owners among them L. N. Rice, J. P. Martin, O. K. and Chester Thompson, James Mosmenm and the McKenna lumber Company had surveys made and decided to divert the water from the Nisqually river and carry it by a main canal and flumes 11 miles to the edge of the Yelm prairie, thence by two main laterals and numerous small distributaries to all parts of the prairie. This was, indeed, a gigantifc undertaking for a handful of farmers. However,, by 1916 work was commenced. At first they tried to divide the work among themselves, every owner building a pi4ece of the ditch. This, however, was soon given to. They bought a steam shovel and Chester Thompson, whose principal experience with machinery heretofore had been with threshing outfits, undertook to operate it and with notable success. Fred S. Sawyer, B. S.
Just three years ago this month, the Yelm Irrigation Company, an organization made up of farmers owning land in the vicinity of Yelm, Washington, began the construction of a main canal which was to carry water from the Nisqually river at a point some fifteen miles south east of Yelm to the prairies surrounding the town. Although at this time the water is not actually serving the land, the next sixty days should see the main channel completed, both ditch and flumes, and the problem of distribution to the prairie land is under way. 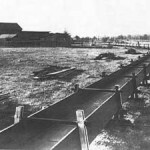 After surveys and estimates had been completed, and attempt was made to interest outside capital, but owing to the financial condition of the country at large, and to the hesitancy with which capital entered into any project that had the word “irrigation” in its name, this method was given up and the directors of the company evolved a plan whereby each member bound himself to construct a portion of the works, said portion being fixed according to the amount of acreage each owner had signed up for was laid out, and in March, 1912, each member began the construction of his section of the canal according to his own ideas of how best the work might be pushed to completion. Camps were established, and while in some cases the farmers elected to do the work by day labor, others let the excavation in sections, by contract. For various reasons, such as press of farm work by day labor, others let the excavation in sections, by contract. For [?] reasons, such as press of farm work and unsatisfactory arrangements with outside contractors, this method of procedure was abandoned and a new tack taken which has been carried out and adhered to with the result that the main ditch is now practically finished. The irrigation company formed a subsidiary corporation known as the Yelm Construction Company, it being the purpose to [?] over all construction to the latter organization, and the actual work to be placed in charge of one man. 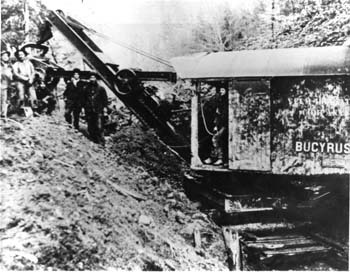 The first act of the construction company was to purchase a steam shovel, the choice being a 14-B Bucyrus steam shovel mounted on a single railroad truck and carrying a five-eighths yard dipper. The directors after serious consideration came to the conclusion that ditching by horse and man power was too slow, and that even though it would be necessary to move twice as much [? ], in the end they would have a larger ditch without generally increasing the total cost. Operations with this shovel began late in the fall of 1912, and work progressed [?] for over two years. 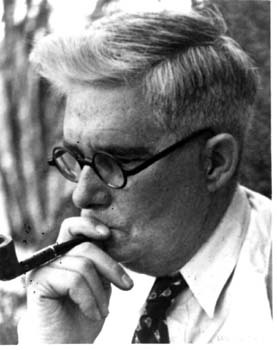 Chester Thompson, a director of the companies, was placed in charge of the work and served not only as superintendent of construction, but [?] as operator of the shovel. Introduction: The following was given to the city of Yelm by the Justman family. In this account, written after World War II, Georgia Justman examines the history of the Yelm Irrigation District, including its relationship to the McKenna Lumber Company. 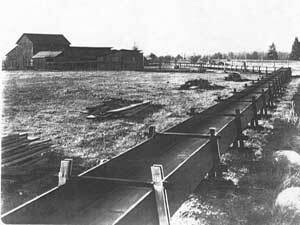 The Yelm Irrigation system was originally built by the Yelm Irrigation Company, composed of landowners on Yelm Prairie. The water right was filed by L.N. . Rice, James Mosman and Tom Chambers for 100 c.f.s. and is on file in the State Department of conservation and Development, State of Washington. The main canal to the Prairie was completed in 1916 and the lateral system in 1917. The Yelm Irrigation District was organized in November and a bond issue of $250,000 was voted in January 1918 and the irrigation system purchased from the Irrigation Company for $143,000 of which $53,000 was paid in cash and $100,000 in bonds at 90%. The water for this project was diverted from the Nisqually River about 12 miles above the upper end of the project. Diversion was made by a brush and rock weir across the river. This was very costly and was in grave danger of being swept away by extreme high water. In 1941 funds were allocated for the reconstruction of the diversion dam at the intake on the river. The main, or diversion, canal originally consisted of 9.25 mils of wood flume, 4×8 feet. 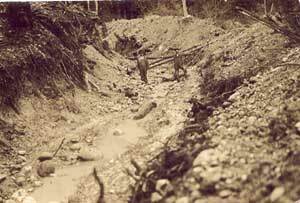 The development of the Yelm Irrigation District was closely related to the lumbering operation in the vicinity. 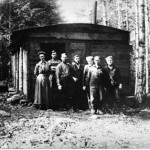 The first settlers in the district were laborers in the McKenna Lumber Mill. It started March 1, 1908 and operated continually until July 7, 1930. 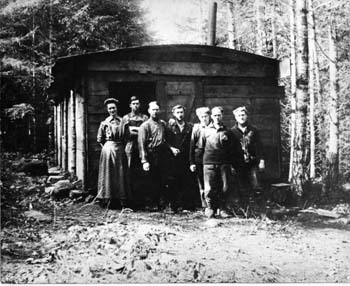 The company carried on logging operations and manufactured lumber, shingles and lath. The capacity of the plant was 200,000 board feet a day. 375 men were employed for one shift. The plant operated 2 shifts part time. At the time the Company quit operation there was still enough timber for another 20 years. The faced 3 options. They shut down for 2 years and hoped for better operating conditions but nothing changed so they began to liquidate the plant in 1932. In 1942 when the report was written, it was still going on. In 1911, 3 years after starting the mill, the two presidents of the McKenna Mill become interested in developing an irrigation district on the Yelm Prairie. The Company had acquired several hundred acres of land on the Yelm Prairie and hired L.N. Rice of [The Engineering]Company of Seattle to subdivide the land into 5-15 Acre [ acts]. On the Justman land deeds it says McKenna irrigated tracts lot 6 A and 6 B etc. The McKenna Land Company sold land to their employees so they could make part of their living on the farms. The sold the land with no down payment, furnished lumber to build their house and barns and some assistance to buy cattle, hogs and chickens. The company hired a full-time farmer to instruct people how to farm. 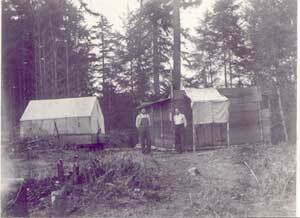 Arthur and Esther Justman moved to Yelm in 1920 and bought 20 acres from McKenna Land Company. A. J. Justman worked as Night Depot agent in Tacoma for the Railroad and also was the Manager of the Olympic Ice Cream Company in Tacoma so this made him experienced in running an office and handling large sums of money. We know A. J. Justman was Director on the Irrigation District in 1929 along with G. M. Lightle and B. E. Strablow when the 8th Annual Yelm Community Fair book was printed. We know A. J. Justman served as a Director on the Ditch for 20 years but have no record for the exact dates. According to the paper published in 1937 Ray Cruikshank was the secretary and manager of the Ditch for the past 6 years so that goes back to 1931. Mr. D. R. Hughes states he was Chairman of the Board in 1937. Three Directors were voted in for 4 Years at a time. They hired the superintendent, secretary, ditch walkers, carpenters and all the employees. The assessment or tax per acres was $3.00 at the first. In a letter written in 1942 it was mentioned by a Farm Security Administrator that the assessment would have to be raised but did not say how much. In 1932 with a record producing crop of berries, the growers found themselves facing a situation where the price of cane berries was considerably below the cost of production. Many of the settlers out of work and depending upon the berry crop as a sole source income were unable to carry on. A. J. Justman rented Mr. Harold Wolf’s warehouse for a Berry Receiving station in Yelm. The farmers would bring their berries to the receiving station for weighing and they received a slip for the amount of berries brought in. A. J. Justman and his sons and other hired drivers trucked the berries to the Olympia Canning Company. This was in the 200s. Art Justman Jr. drove truck from 1939 when he was 17 until after the war in 1945. One year the canneries stopped buying berries. The Olympia Canning Co. only bought berries that were signed up. A J Justman found a canning Company in Oregon who would buy the farmers berries and saved the crop for the farmers who otherwise would have lost everything. They said, “Art we will never forget you for this.” The one that said it sold to someone else the very next year. In a letter written by Albert Molenaar, a State Water Utilization Technician, states, The Yelm Irrigation District has approximately 3500 acres of irrigable land under its canals and laterals. Recent estimates in my report on the District’s Irrigation system indicate that…half was actually irrigated in 1942 and acreage in 1943 will be considerably less than in the past season…During the last few months farmers…have quit farming and gone to work in war industries…Of farmers operating in the area only 25% were left by the middle of October 1942…Many retain their homes and just live on the farm. This exodus of farmers is attributed to high wages in war industries and difficulty in getting labor to harvest the crops. The main reason, in my opinion, farmers are very poorly suited to farming in the Irrigation District Area. The number of farm units is reduced from 275 by the census survey in 1939 to 100 units now 1942…The committee members are faced with getting the land that is vacated back into production. Unless they are successful in their efforts to find operators for the land, a large percentage of the cultivable and irrigable acreage will lie idle in 1943. This idle land will seriously effect the welfare of the Yelm Irrigation District…because revenue will not be collected from idle land. In the Yelm area are some 3500 acres of irrigable land of which 2000 acres will lie idle in 1943. In the past farmers have depended on small acreage of highly intensive and specialty crops, mainly cane berries…Mosaic disease in the canes and several years of low prices for the crops have brought about a great reduction in berries. The trend is to go toward dairying and a limited diversity of poultry. A failure of this District would be a serious matter not only to the inhabitants, but to Thurston County as well. In 1946 right after the War Mr. Kanff, Jack Conner, manager of the Puget Power in Yelm at that time, and one other man were elected to the Ditch Board. These men were the ones who raised the Irrigation Tax to $10.00 an acre and spent a lot of money trying to fix up rotting flumes and ailing ditches and put in concrete siphons under the roads. The directors at that time tried to raise the tax to $20.00 an acre. The farmers got together with Mr. Harold Brogger of the Bureau of Agricultural Economics and formed a group called the Taxpayer Association. They put pressure on the Directors so they left the Irrigation Tax at $10.00 an acre. This was in 1948 and 1949 and Art Justman Jr. remembers it was $6.00 an acre before that. If people could not pay their Irrigation Tax their land was taken over by the Irrigation District. They had 2 years to redeem their land or it would be sold to the highest bidder by written bids. Many people lost their land. In the last part of 1949 Governor Arthur B. Langlie appointed Arthur J. Justman to close the Irrigation District together with the Department of Conservation and Development. There was so much opposition to the closing of the Ditch that good friends were on opposite sides. The town with their small garden plots got their water but the farmers with large acreage faced $10 an acre for 3 years in a row and not getting water on their land. The town business men who made money off the Irrigation District and the people who were employed wanted to Ditch to continue. The Director of Conservation and Development told Arthur J Justman that the State could cancel the Bond Issue indebtedness for they had done so for other Irrigation systems in the State, but because of the opposition to closing the District, an extra charge of $10 an acre was assessed to pay of the Bond Issue. Many could not pay and lost their land. Bill Goodwin Jr. was the attorney for the closing of the ditch. The District operated from 1918 until 1950-32 years. A J Justman was on the Ditch Board for 20 of those years counting the year it took to close the District. Report of the Yelm Land Use Planning Committee submitted February 1942 concerning the Yelm Irrigation District. Farm Management Department, State College of Wash. The report read as follows: “The Yelm Irrigation District is comprised of some 6,000 acres of comparatively level land of which about 4,300 acres are easily irrigable. The land is of glacial formation and therefore gravelly in texture. The topsoil is black and from one half to three feet in depth. In 1910 a few of the landowners conceived the idea that irrigation of this land would greatly increase its yield and thus provide home for many more families. “Five of us made a trip to look over an irrigation system which was serving a similar formation; and we employed L. M. Rice of L. M. Rice and Co., Engineers, Seattle, to go over the land and advise us as to the feasibility of irrigation. Before we realized, we had contracted a $4,000 engineering bill. “The engineers recommended the construction of a main canal, eleven and a fourth miles long, three and one half feet bottom width, one to one and a half feet slope, five feet deep with an average grade of two feet to the mile – sufficient to deliver 50 section feet of water. They estimated the cost at $76,000, which was about $40,000 more than we had anticipated. “We called a meeting of land owners, but only a few of them were willing to organize into an irrigation company. The rest of us went ahead. We issued stock in proportion to the number of acres each stockholder owned. Then we drew up a water contract and endeavored to get owners of prairie land to agree to take water from the company when the system was completed. Some 3,300 acres were place under contract, and the company endeavored to finance itself by issuing bonds against these contracts. “We filed for water at a point on the Nisqually River, Section twenty, Township sixteen North, Range three East; but when the engineers arrived, they found that the level at the point was the same as that of the point of delivery to the land. The next day we went up river to a small clearing known as the Frank Hendrick’s place and filed again for 400 second feet of water. This time the levels showed an elevation of some 28 feet above the delivery point. “After the engineers had located the ditch line, we endeavored to secure the necessary rights-of-way. These we acquired only after months of litigation and cost already due for survey, we met by assessments levied against stockholders. “We employed another engineering company to stake the line by stations and determine the exact yardage to be excavated. The service cost us another $1,000. We then prepared a prospectus and presented copies to several contracting firms for bids. 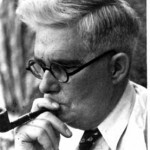 “A wooden pipe company of Ballard became interested. They suggested that we use wooden pipe for the full length of the ditch and estimated the cost at $83,000. They tentatively agreed to accept $110,000 worth of our bonds at a discount of 15 percent plus 7 percent interest; but when we sent a representative to Seattle to complete the deal, the attorney turned it down. The bonds were secured only by water contracts, he said and these were not valid until water was delivered to the land. “Finally we met at the home of L. M. Rice and discussed the feasibility of doing work ourselves. We knew the yardage to be excavated for each station. Each of us, we decided, would clear the right-of-way and excavate a length of ditch in proportion to the number of acres he had under contract with the company. That evening we drew lots for positions. The Salsich Lumber Co. of McKenna agreed to furnish lumber for the construction of flumes. “Most of us were established in our campus by March 12, 1912. Clearing the right-of-way progressed satisfactorily, but excavation proved to be a problem. The land was rocky and difficult to work. The cost of labor was a steady drain on the pocketbooks of those of us who had to pay. Men got sick: horses died. General discouragement set in, and before long we concluded that some better way had to be found to remove the dirt. 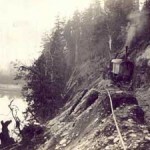 “We considered hiring a steam shovel and we contacted several companies, but without exception their answers were the same: The ditch was too narrow. It would have to be enlarged to allow the machine to operate in the bottom. This would mean that the yardage to be removed would be increased several times, and the cost would become prohibitive. “We discussed buying our shovel, but a majority of company members rejected the plan. 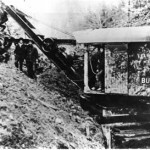 As a result the more stubborn of us organized the Yelm Construction Co. We purchased and 18 ton five eighth dipper Bucyrus Shovel at a cost of $4,500. It arrived in Yelm on Oct. 13, 1912. “We put Chester Thompson in charge and allowed him to select his own crew. He established camp about a fourth of a mile up the right-of-way, and on the first of November he started work. Day after day the shovel crawled up the ditch on rails that had to be moved ahead at each setting. Two years passed before it reached the point of intake. Then on the day Thompson was to cut into the river, the Stone Webster people filed an injunction, and work stopped until sanctions were removed. “Then began the job of puddling. This proved to be a long and costly process. A considerable distance of ditch was located on the side of a canyon where the formation was very porous. At one point, just about the Bolt camp, this was particularly true. When the shovel crew cut the ditch, workers reported that wind came through the bottom and sides strong enough to lift their hats. “By damming the ditch we maintained enough water to float a scow which we built from flume lumber. This we loaded with dirt and sand which we spread on the sides and bottom of the ditch. The water finally flushed through. “Lower down we encountered the same problem. The last nine miles through the prairie were a constant fight. We tried everything – scows loaded with sand and dirt, centrifugal pumps washing the upper bands to get dirt where it was needed, horses dragging fir trees down the ditch. When we got to Longmire meadow, it looked as though we had gone as far as we were going to get. This stretch, about a fourth of a mile, was on the north side of a gravelly hog back which separated the two Longmire meadows. The water that got that far spread out into a lake. “There was no puddling material except at the east end of this part of the ditch, and there was no road to get a team and wagon to it. We managed to get a wagon to the top of the upper cut. There we disassembled it and lowered it, piece by piece, into the ditch where it was assembled and pulled by and horse along the ditch bottom to a place where dirt was available. Again we disassemble the wagon and turned it around before loading. By repeating this process for days we eventually lined the sides and bottom of the ditch to the point that it would carry water. After months of this kind of work, we shut off the water and the crew went over the entire ditch, repairing all the weak places. 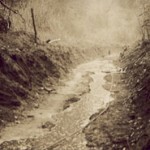 “That winter the river flooded two feet over the intake, filling three hundred feet of the ditch with silt and gravel. Upper sides of cuts washed down. Side hills slipped and took sections of the new flumes with them. “The prairie had water, but no laterals to distribute it, and the construction company was financially exhausted. The Selsich Lumber Co. about that time disposed of its holding to the McKenna Lumber Co., which was persuaded to give aid in the amount of $22,000 to be used to build the three main laterals and most of the sub-laterals. 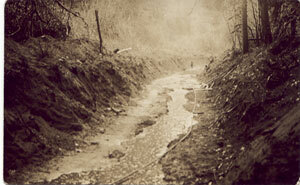 For several years celebration were held on the anniversary of the opening of the ditch. 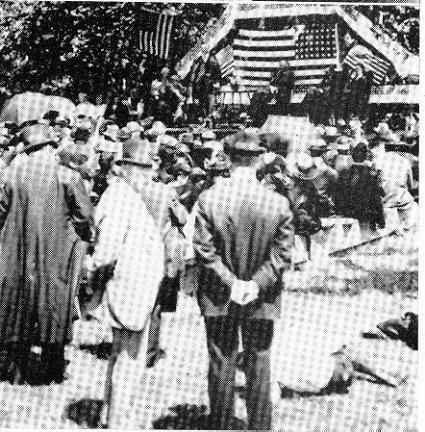 The second annual picnic, June 20, 1917, ended in near tragedy. The Tacoma Tribune of July 1, 1917, carried the story: “Collapsing on a steep hill side, a broken main flume nearby spoiled the Yelm prairie people’s second annual celebration of the opening of their extensive irrigation development Friday, but with the energy that has characterized the seven-year fight to overcome a handicap imposed by nature, Yelm men worked 15 hours to repair their break. At 4:40 o’clock Friday morning they went home confident that when the anniversary picnic was gathered in Rice’s grove, water would be flowing through a previously dry canal. 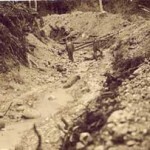 “At 11:30 as the crowd assembled, the ditch began to fill, and in an hour a fine big flow was running down the lateral past the picnic ground, gaining speed and carrying the message of Yelm’s labor to the hitherto more or less unproductive soil. When the ditch was completed last year, water could not be run through it in time for the first picnic, and the men of the vicinity worked with more than ordinary vim that the second picnic might not be marred by a dry ditch. But the crowd did not go hungry. The newspaper account continued: “Seventy-two fried chickens, eighty cakes, a hundred pounds of pressed ham, seventy-five pounds of wieners, and ninety of the finest, juiciest pies that ever came out of an oven fell under the crowd’s ravenous assault. 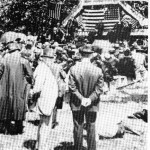 “The Yelm Ditch picnic held last Sunday at Goldsmith’s Grove was one of the most successful affairs ever staged locally. The crowd began to gather early in the day and continued until afternoon. “The morning program of races was supervised by Ray Norton and his helpers. Prizes of cash and merchandise were awarded the winners, and both young and old seemed to enjoy themselves.